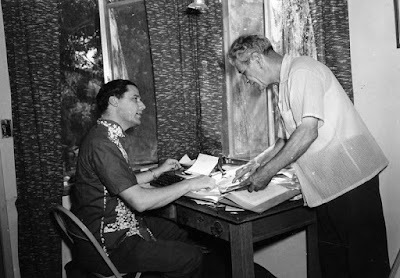 Many books and thousands of articles have been written, both pro and con, about George Adamski. But now, for the first time, his photographs has been digitally enhanced and evaluated by a professional photographer – Rene Erik Olsen from Denmark. He is a painter, photographer and researcher. Olsen documents his investigation in the beautifully illustrated The George Adamski Story – Historical Events of Gigantic Implications. Information about Rene Erik Olsen and the book can also be found at his website. 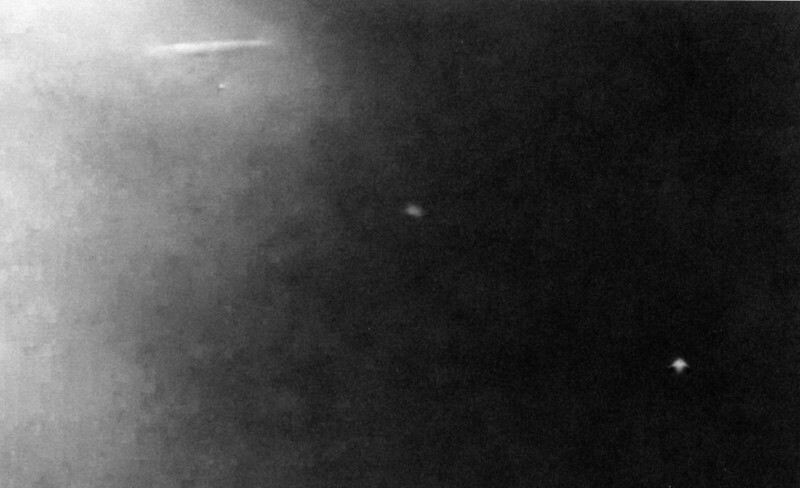 This unique investigation may be the first step forward in making Desmond Leslie´s hope of authenticating the Adamski photographs come true. 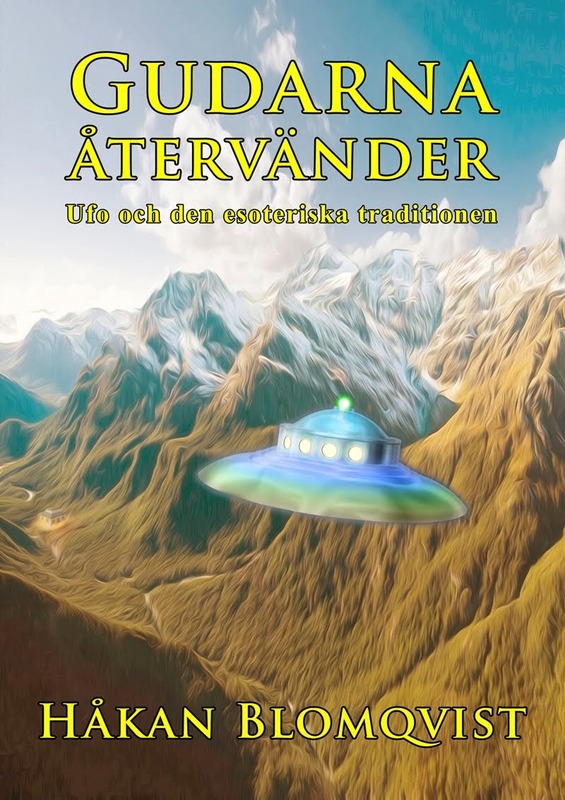 Olsen is not a ufologist but has been marginally interested in the subject for many years and in the 1990s did some illustrations for the Danish group SUFOI and Adamski co-worker H.C. Petersen. In 2001 Rene contacted Glenn Steckling, director of the Adamski Foundation as he wanted to do a computer animation of George Adamski´s contact experience November 20, 1952. From Steckling he received copies from the original negatives. But other projects engaged Olsen for 16 years until 2017 when he finally decided to make digital enhancements of the Adamski photos. It was then he made a revolutionary discovery. There was much more on these photos than even Adamski himself could have guessed. 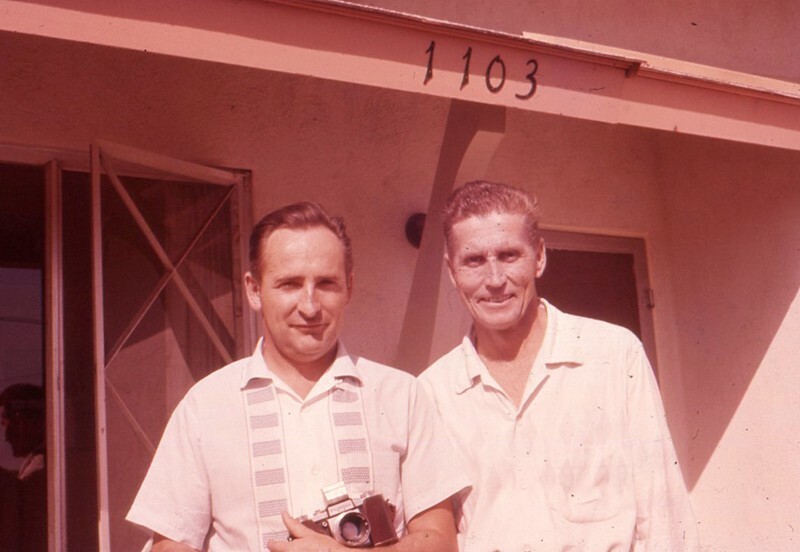 Olsen have done enhancements of the three out of four Kodak Brownie photos George Adamski took on November 20, 1952. Also one telescope image from the desert contact, used by Glenn Steckling in his talks. The enhancements are done in Photoshop. The image enhancement process in respect to each Adamski photograph is documented. 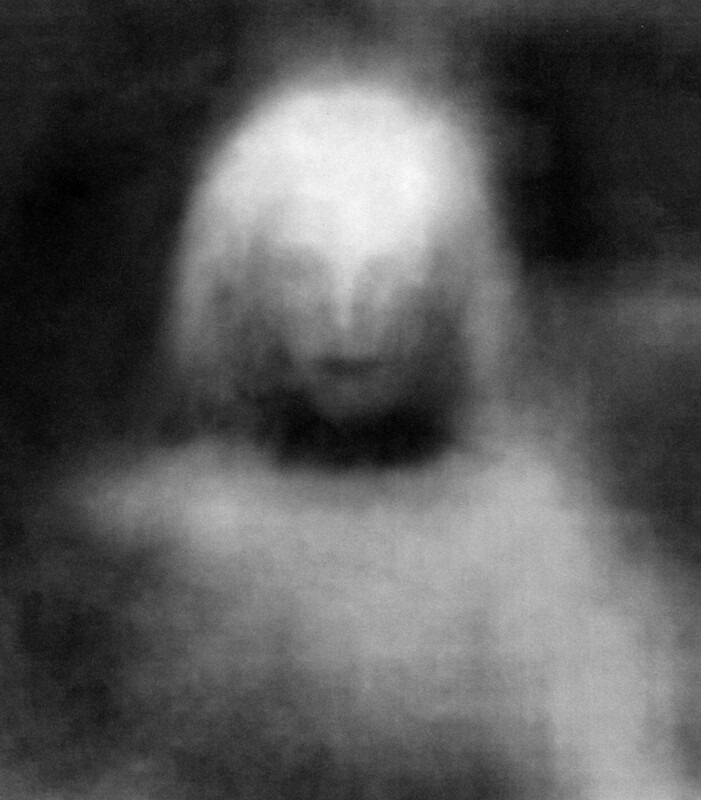 Olsen remarks that it ”does NOT change or manipulate the actural image (change what is already there in the frame), but does make the image sharper, remove noise, make some areas darker or lighter, make shadows lighter or darker and make highlights darker. These are the same image enhancements/processes I use on every image I take”. In one of the Kodak Brownie photos the upper left hand and right hand corners of the image is very over-exposed. When enhanced this photo clearly shows the large cylindrical-shaped mothership or carrier craft with three smaller craft in the vicinity. 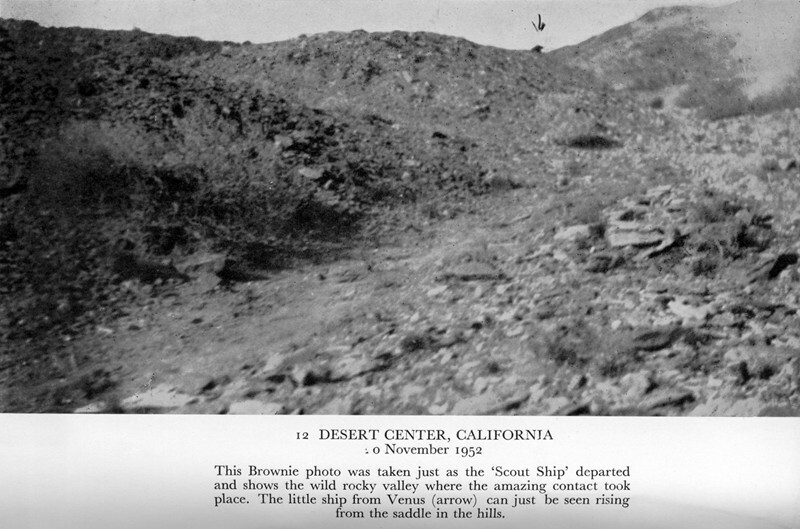 Many times I have looked at the Brownie photo of the rocky valley in the original edition of Flying Saucers Have Landed. 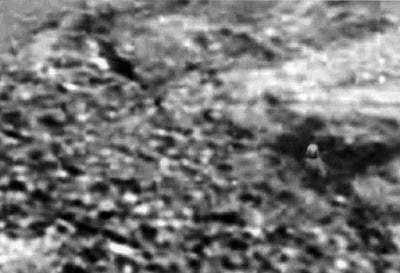 In the background a small dark object is visible which is said to be the scoutship rising. I have always found this photo a bit disappointing and have, like Olsen himself, thought this was just the upper part of the craft which could be seen. But an enhancement of this photo show much more details of almost the whole ship. The dome and cabin are very distinct. I am not so sure this is the explanation. In the 1950s no one could have found out what was hidden in the photo. The first image-processing software was developed by Jet Propulsion Laboratory in the 1960s for satellite image processing. There was no Photoshop until the late 1980s. Photo by George Adamski, December 13, 1952. Notice the semi-transparency of the left sphere. 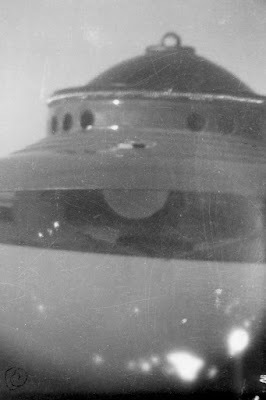 There are several more photos enhanced and studied by Olsen and also an analysis and discussion about the technology and propulsion systems used in these craft. An obviously very efficient and powerful clean energy, ”which the Planet Earth sorely could use”, concludes Olsen in his final chapter. The last pages of the book is an Image Section with additional Adamski photos and some very beautiful paintings of craft and the ”crew member” Orthon, as imagined by Olsen. Truly a feast for the eye. (Email from Rene Erik Olsen, May 28, 2018). 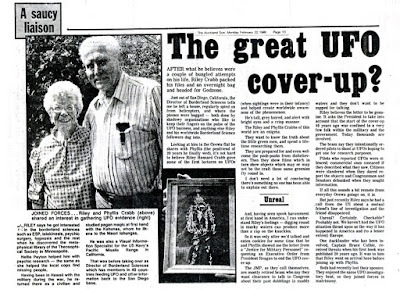 My late friend ufologist Franck Boitte was, because of personal experiences, convinced that ”there is in the George Adamski saga much more than meets the eye.” A new generation of investigators and authors have reopened the Adamski case and provided much new information regarding this controversial contactee: Timothy Good, Tony Brunt, Michel Zirger, Maurizio Martinelli and Warren P. Aston. We can now add Rene Erik Olsen to this list. 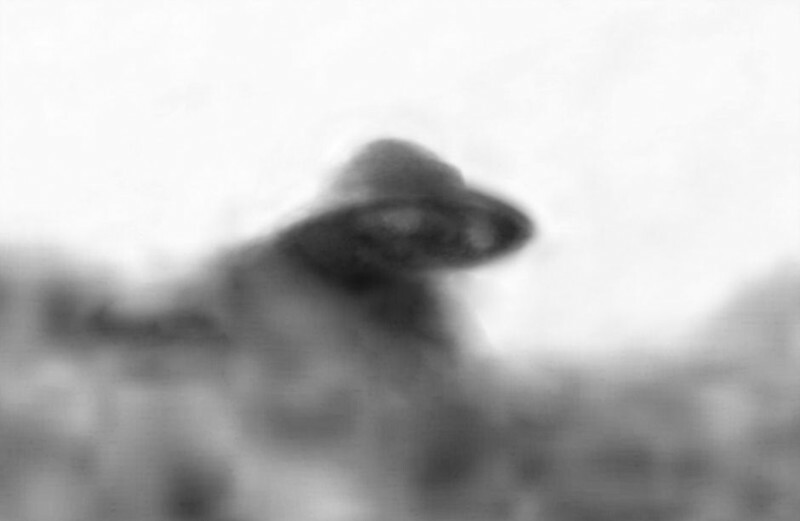 Their findings also support the theory I have personally advanced that some of the 1950s contactees were authentic and involved in a cultural, psychological influence test made by a benevolent groups of alien visitors with access to Vimana technology. 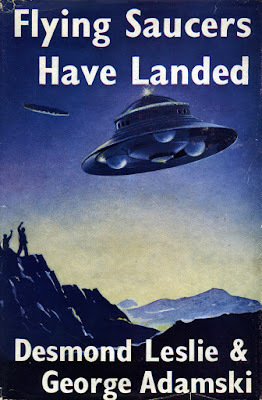 When a revised and very much enlarged edition of Desmond Leslie´s and George Adamskis´s Flying Saucers Have Landed was published in 1970, Flying Saucer Review editor Charles Bowen aptly named it The Book That Was Dynamite. This classic tome, originally published in 1953, changed the course of UFO history and the life of thousands of people – including my own – when I as a young teenager found it in my parents bookshelf. After almost 50 years in the UFO movement it is very seldom that I wholeheartedly and without reservations recommend a new UFO book. 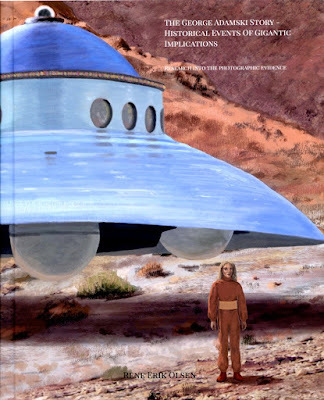 The George Adamski Story by Rene Erik Olsen is a real challenge to the UFO research community. The book is only 99 pages, but it is 99 pages of dynamite. Read it! 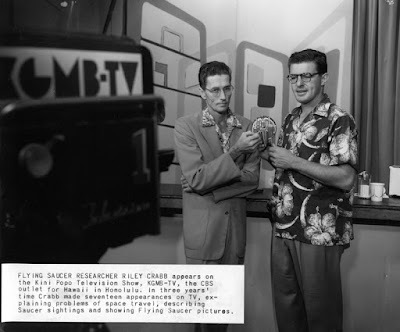 During the 1950s and 60s there were three channelers or mediums that had a large impact on the ideas and writings presented by Borderland Sciences Research Foundation (BSRF) directors Meade Layne and Riley Crabb. They were Mark Probert, Ralph Holland (Rolf Telano) and Gerald Light (Dr. Kappa). Two of the channelers, Holland and Light, can also be regarded as UFO contactees. Mark Probert and Ralph Holland are quite well known and biographical data is presented both in books, articles and on the internet. But when it comes to Gerald Light information is very hard to find, except a few comments and articles in BSRF´s magazine Round Robin. An internet search will almost only give references to Light´s famous 1954 letter to Meade Layne, with the story of Eisenhower´s meeting with space people. 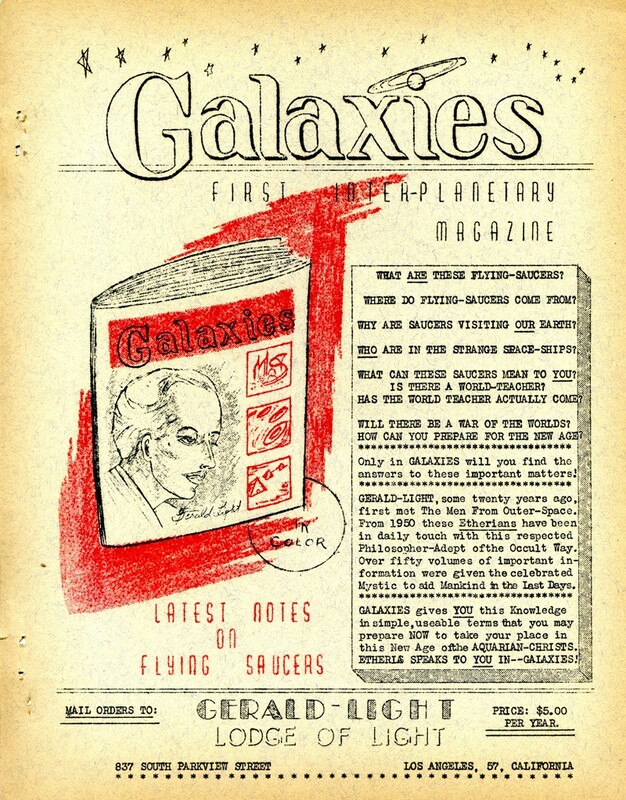 One of the reasons for this scarcity of data on Gerald Light is probably because the many booklets and pamphlets he wrote were published on low quality paper, which today is so fragile that it is almost impossible to handle without destroying. In the BSRF archive donated to AFU, I have found, besides the original 1954 letter, no less than thirty booklets written by Gerald Light. They are so fragile that it will be impossible to keep them in our regular AFU library so I have digitized all booklets to preserve them for research and study. 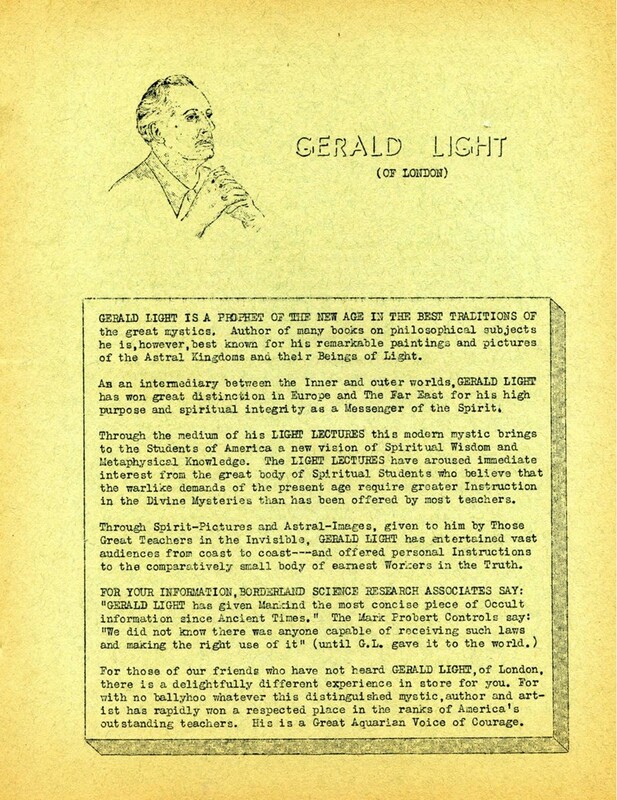 There is not much information about Gerald Light´s activities in the 1940s. He appears to be one of the founders of The Aquarian Society in 1941. An association of occultists and Christian mystics working for the coming of ”The Lord Aquarion” (Christ) who ”entered the Etheric Aura of our Earth on Christmas Day 1941” and will stay until Christmas Day 2011. 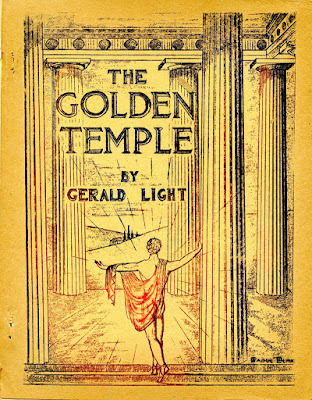 In the 1950s Gerald Light founded The Lodge of Light in Los Angeles and then his contact with Meade Layne of BSRF began. 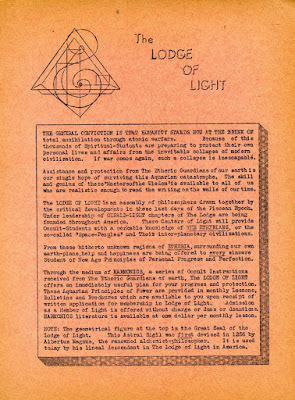 The Lodge of Light published 36 lessons, Harmonics, many small booklets, a bulletin and also a magazine named Galaxies. (Gerald Light, Etheric Notes 2). ”Could it be, with abject apologies to the CS`ers, that there is nothing but matter? That Matter is the One Supreme Element of the Universe of Universes. The God of Gods, the Heavenly Absolute of Absolutes??? The Etherians say – Yes! They of OuterSpace declare Matter to the the All of All. The magnificently superior Beings streaking through our skies insist that ”beyond matter there is nothing”. (Gerald Light, Etheric Notes 4). (Gerald Light, Etheric Notes 5). 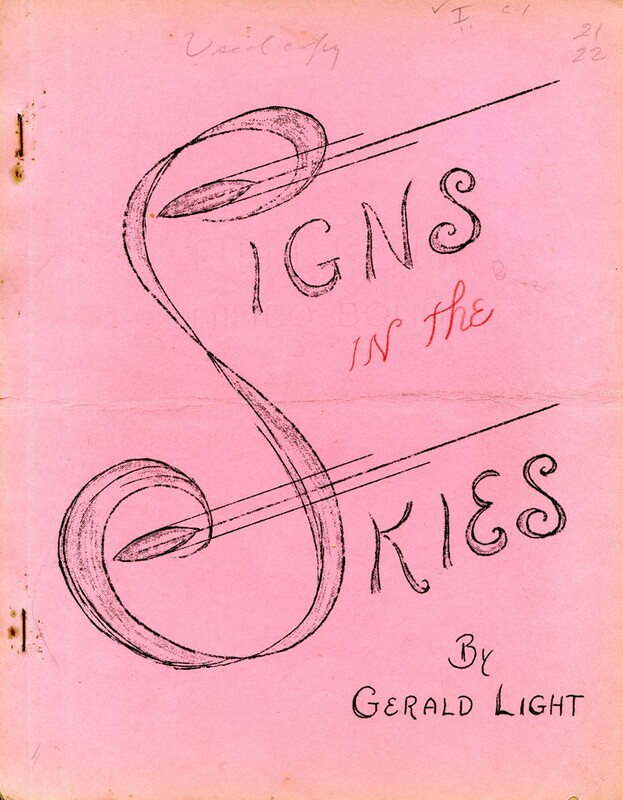 An internet search for Gerald Light will almost exclusively yield references to his classic 1954 letter to Meade Layne on Eisenhower´s meeting with extraterrestrials. The obvious questions is of course why would an relatively unknown California occultist be invited to such a historic event? Given that this contact actually happened I can think of two options. 1. 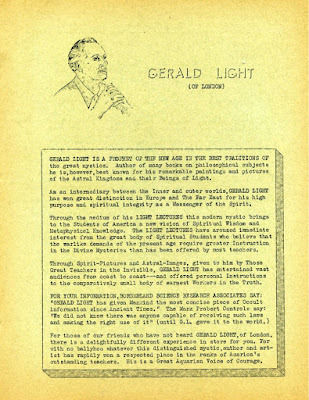 Gerald Light witnessed this event but with the help of remote viewing or astral travel. 2. He heard rumors of the Eisenhower contact with extraterrestrials and made it his own story. (Round Robin, vol. 9, no. 5, Jan-Feb. 1954, p. 2). Riley Crabb, who entered as director of BSRF in 1959 was seemingly of a different opinion regarding Gerald Light. In 1960 Riley Crabb received an undated letter from Theosophist Evna Edmundson, who expressed grave doubts concerning Light. He had been invited to speak for the Theosophical Society headed by Edmundson. As she was very knowledgeable about astrology she, before the lecture, asked Light som questions. But he proved to have a very superficial knowledge of the subject and only delivered a few platitudes: ”I gave him plenty of rope and he ”hung himself in moments” with me”. 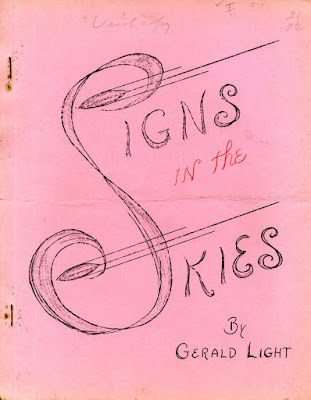 Just as the lecture was about to begin Gerald Light slipped out, telling someone at the door he had another engagement. (Round Robin, vol. 27, no. 6, Nov-Dec. 1971, p. 33). 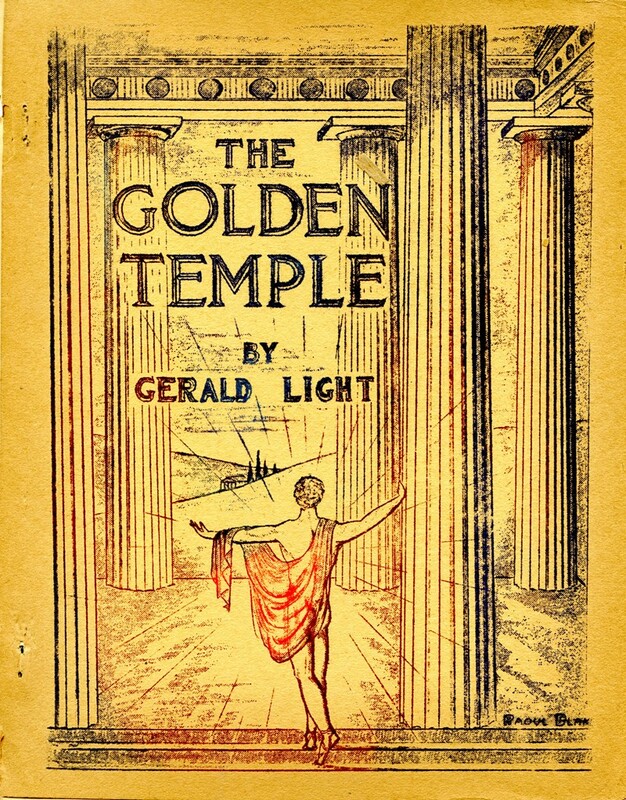 Whatever the truth about Gerald Light he was a fascinating figure in the underground world of mystics and occultists. He claimed to have been a member of most of the known metaphysical and esoteric societies in the 20th century and have a library consisting of more than six thousand volumes upon every phase of occultism and mysticism. But I can only wonder at the spiritual discernment of a man who listen in awe to a giant, one-eyed robot-like humanoid, who suddenly materialize proclaiming: ”observe Our Genius”. Readers of my blog are aware of that the very extensive and unique archive of Borderland Sciences Research Foundation (BSRF) has been donated to AFU, arriving in two large shipments. The major part, 72 boxes, donated in July 2016 by present BSRF director James Borges, Eureka, California. The second shipment, seven boxes, donated in April 2018 by Thomas J.Brown, New Zealand, director of BSRF 1985-1995. Of special interest to me has been the large correspondence file of my late friend and mentor Riley Crabb (1912-1994), director of BSRF 1959-1985. So far I have reviewed and digitized 300+ letters to and from Riley Crabb, written between 1952-1989. This collection gives a profound and fascinating insight into his life and work of inestimable value to ufologists, esotericists and researchers of paranormal phenomena. Riley Crabb was born on April 2, 1912 in Minneapolis, Minnesota. In 1934 he discovered the library of the Theosophical Society in Minneapolis and became an avid reader of all the literature he could find. In this search he may have been inspired by his mother, Mrs. Eunice Crabb, who was a student of philosopher and esotericist Manly Palmer Hall, founder of the Philosophical Research Society. In Minnesota Riley married Marion Crabb. 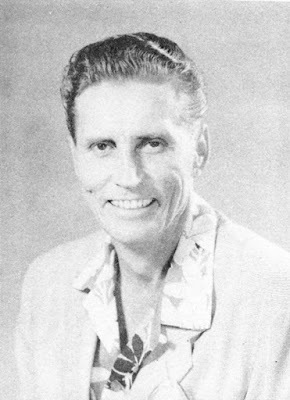 During World War Two military service took him to Hawaii and he returned to the islands in 1946 working as journalist for the mid-Pacific edition of Stars & Stripes. The career continued as publications editor and information specialist at Naval Supply Center, Pearl Harbour. A job he handled with great skill receiving a $200 cash reward from Rear Admiral J.L. Herlihy: ”… in recognition of your superior performance of assigned and additional duties”. (Letter from Rear Admiral J.L. Herlihy, Oct. 5 1955). It was in Hawaii that Riley Crabb met his second wife Judy and the couple settled in Honolulu. 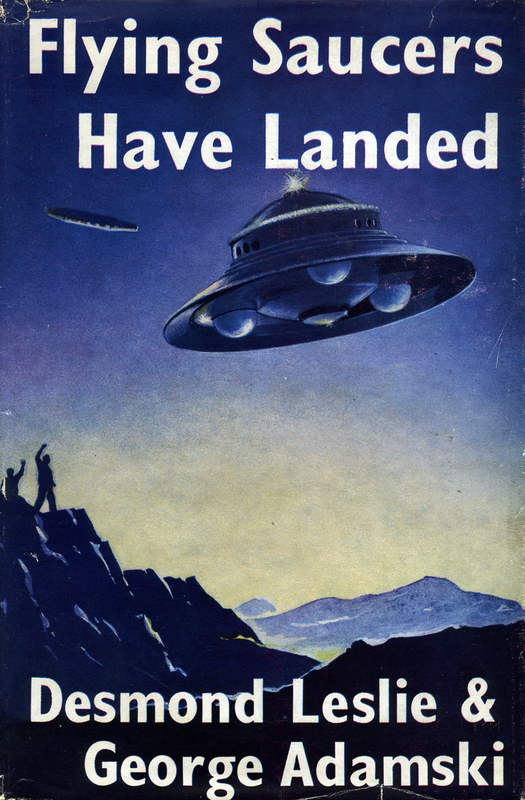 Interest in UFOs began when Riley found an article on flying saucers in True magazine 1950. Already in 1951 he joined Borderland Sciences Research Foundation and started lecturing on UFOs in 1954. This resulted in founding of the Akualele Research Group 1956. Akualele is a local word for ”godly fireballs” or ”fire spirits”. 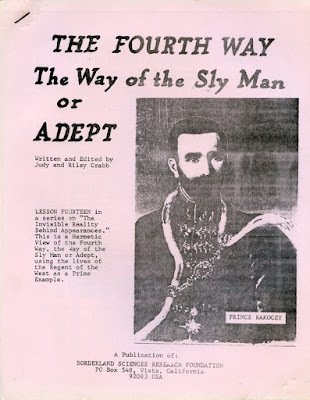 During this time Riley Crabb was also President of The Honolulu Lodge of The Theosophical Society in Hawaii and deeply fascinated by the native kahuna religion and magic of Hawaii, which he learned from Charles Kenn, David ”Daddy” Bray Kino Lau and others. 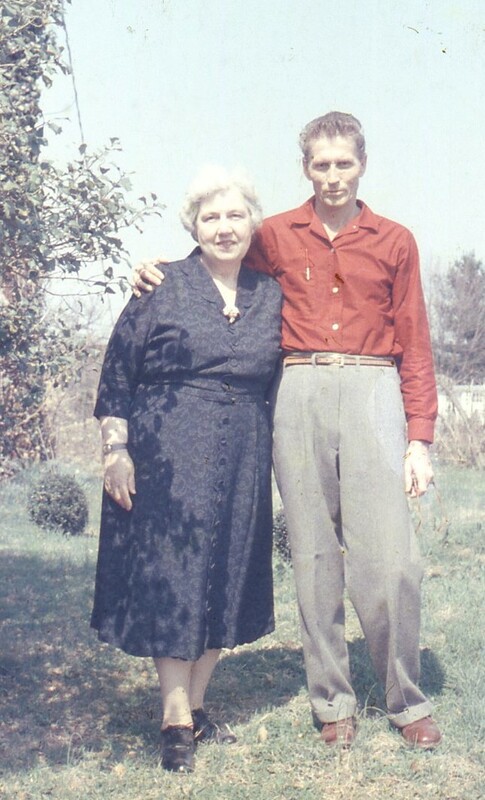 During 1955-1956 Riley corresponded briefly with astronomer and ufologist Morris Jessup. In one of his letters Jessup planned to write about the more esoteric ”Elder Brother theme”, but nothing came of this idea. 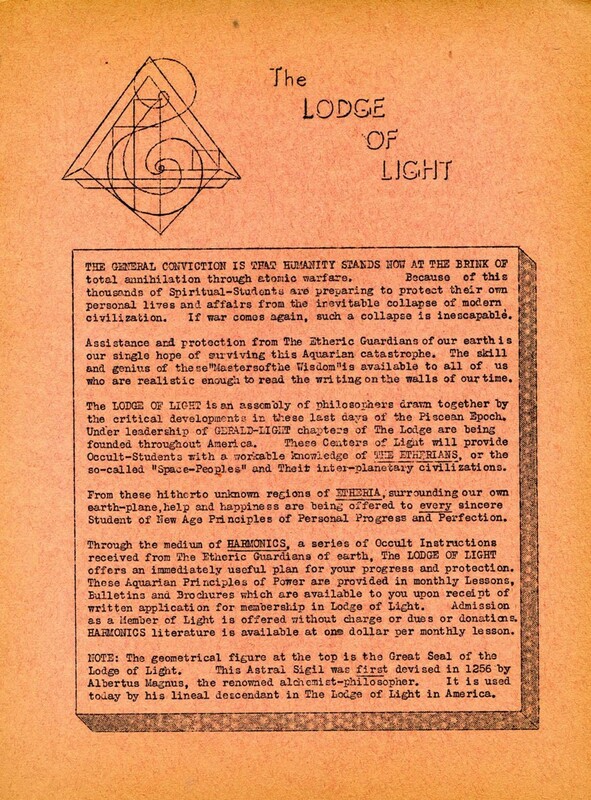 As esotericist Riley Crabb realized, in the 1950s, that his special project or mission was to study the UFO enigma in relation to the Esoteric Tradition: ”With my years of study and membership in two Mystery Schools, the Rosicrucians and Theosophy, my particular field seems to be to relate the teachings of the Schools to the coming of the Saucers.” (Letter to Elvira Cleary, May 24, 1958). 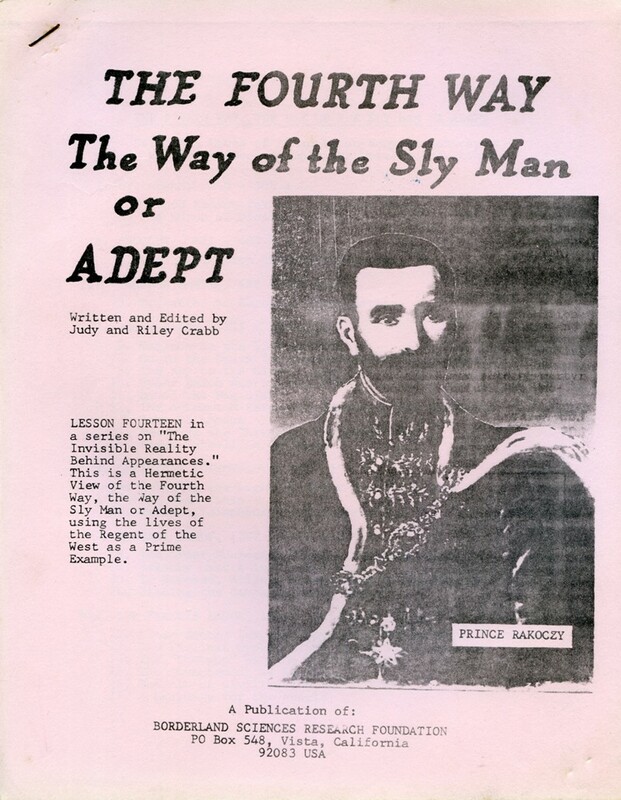 This was to be the unique approach during all his years of research and writing, thereby following in the footsteps and tradition of prominent esotericists such as Meade Layne and Desmond Leslie. 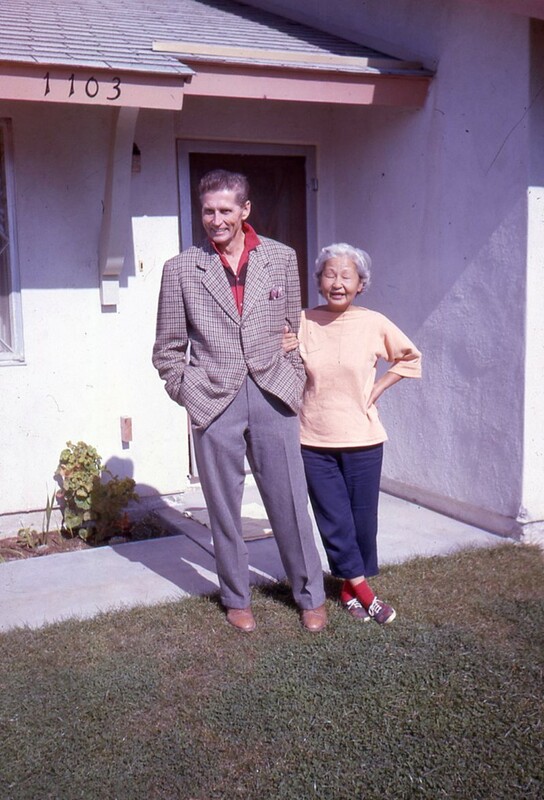 In August 1957 Riley and Judy left Hawaii and settled first in Barstow, California where Riley found work as Assistant Employee Relations Officer at the Marine Corps Supply Center. He tried to find a Civil Service job in San Diego but in June 1958 the couple instead left Barstow for Camarillo, California. Riley had applied for work as Visual Information Specialist at the U.S. Navy´s Pacific Missile Range, Pt. Mugu. 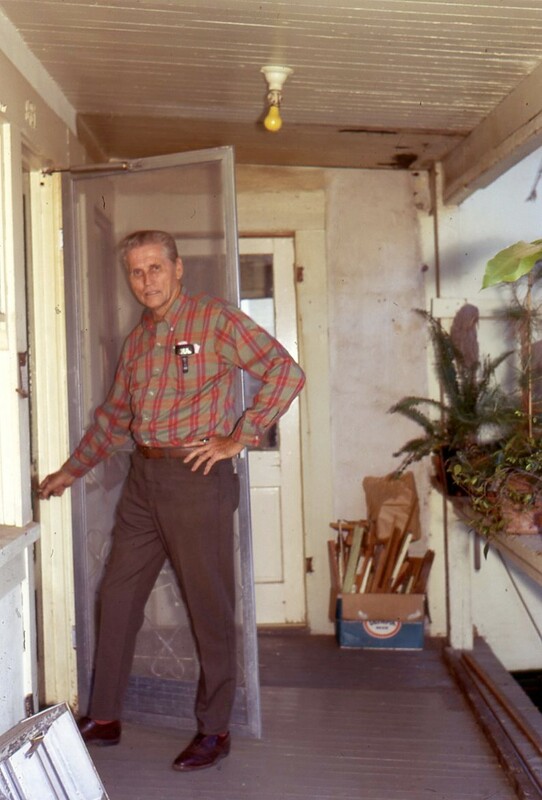 Immediately after coming to California Riley began lecturing to various UFO- and other societies, especially the many local units of Understanding, founded by contactee Daniel Fry in 1955. He also maintained a voluminous correspondence with friends and fellow researchers. In this respect both Riley and Judy soon found themselves in demand as teachers and counsellors in the rather wild occult underground world of southern California. As esotericist Riley always tried to advocate balance and common sense in UFO and spiritual studies and investigation: ”I just wonder how long you must continue developing the devotional side of your nature before striking a balance? There comes a time in spiritual progress, you know, when love must be balanced with knowledge. By this I mean detailed knowledge of the higher worlds… You wont find this needed information in Joel Goldsmith or in Krishnamurti, nor in Christianity. All of these emphasize only one aspect of the Trinity, the devotional or love aspect. If you continue to shy away from the detailed knowledge of the higher worlds, which Theosophy can give you for instance, unbalanced development may eventually cause you as much unhappiness as did your previous condition.” (Letter to Gay, January 11, 1959). 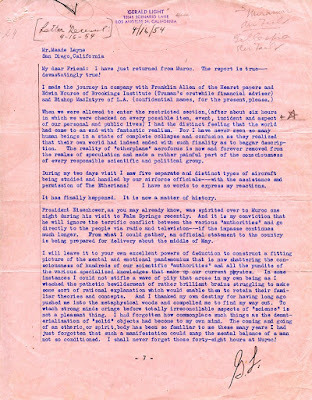 During the Spring of 1959 Meade Layne´s health and eyesight declined and he started hinting in letters that he would have to close BSRF if a new director couldn´t be found. Riley and Judy travelled back and forth to San Diego several times discussing this issue. Finally they decided that BSRF must be saved at all costs and revealed their plans in a letter to Fred: ”Meade Layne, director of Borderland Sciences Research Associates,… has asked me to take over. Judy and I are going down this weekend to try to settle the deal and to see if I cant make a good living out of it for both of us. 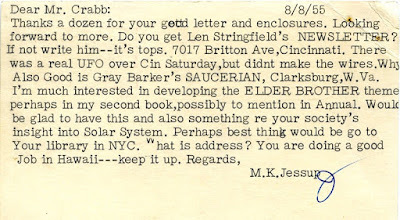 It certainly would be wonderful to put full time into BSRA as it is the ideal combination of Flying Saucers and metaphysics research, with a world wide mailing list and plenty of opportunity for writing and lecturing.” (Letter to Fred, April 30, 1959). 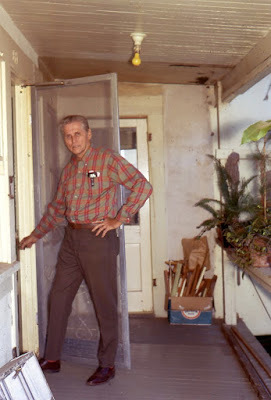 Riley Crabb ended his Civil Service career at Pt Mugu and on May 16, 1959 Riley and Judy moved to San Diego, where the BSRF headquaters was situated at 3516 Adams Avenue. 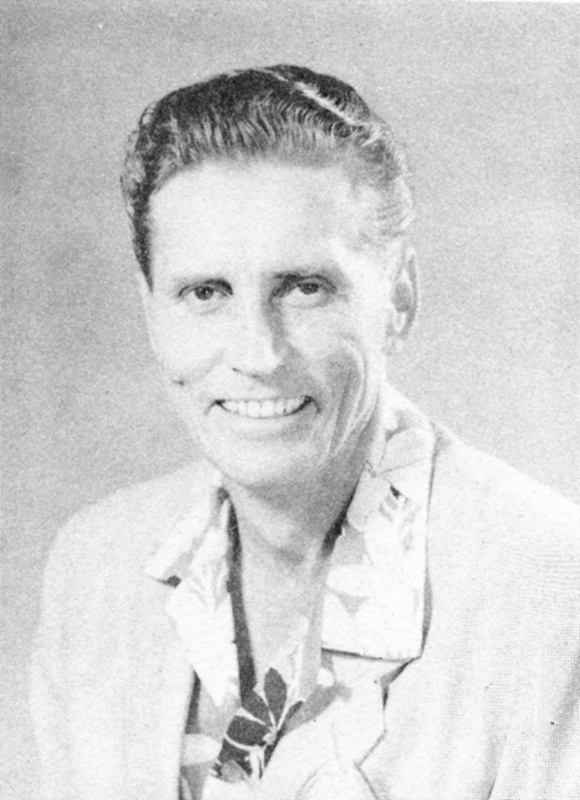 Meade Layne resigned formally as director on June 1, 1959. Riley was now director, including editor of Round Robin and Judy secretary and treasurer. Taking over the BSRF business was a bigger job than they had anticipated. The headquarters was more run down than was at first apparent. But there was also another problem. Although BSRF was a non-profit association Meade Layne insisted on selling it as a business to his successors. They finally agreed on $1,200 to be paid at the rate of $50 a month. In Round Robin, October-November 1960 Riley Crabb explained that ”… Mr Layne had no legal or moral right to sell it; nor for that matter did I have any right to buy it”. But Riley and Judy accepted these terms as they regarded BSRF as such a unique organization that it must somehow survive. Soon they also discovered that BSRA had been incorporated as a not-for-profit foundation in 1951 but Meade Layne had never bothered to turn in any annual reports. To manage the first year they had to spend all their personal savings but they also received donations from members and survived the first hard years. BSRF was now there sole source of income. There is some problem whether to use the acronym BSRA or BSRF. Borderland Sciences Research Associates (BSRA) was an informal group created by Meade Layne in 1946. Borderland Sciences Research Foundation, Inc. was formed into a legal corporation on May 21, 1951. At the first board meeting in 1959 Riley Crabb suggested that the new name should be Borderland Sciences Research Associates Foundation. But usually the shorter version is used in writing. Riley and Judy Crabb now began the hard work of getting BSRF into order while planning for a new home. The chose the small, peaceful town of Vista, California, and found a home at 1103 Bobolink Drive, which also eventually became the new BSRF headquarters. 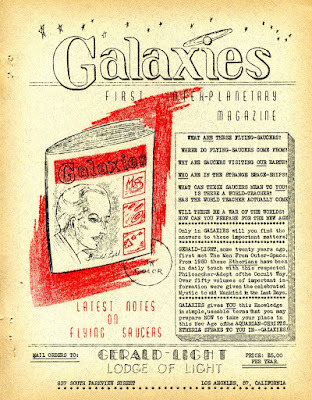 I´ve always admired Riley Crabb´s ambition and motto presented in his first Round Robin editorial, July-August 1959, under the headline, About the New Editor: "Since coming to the mainland my lectures have been concerned with the problem of relating Flying Saucer data, and phenomena, to the teachings of the Mystery Schools. I believe you´ll agree this is no easy task. If I have one goal in life it is un uncompromising search for Truth, whatever that might be, and wherever it may lead." Beginning with the January-February 1960 issue the name of the journal was changed to Round Robin. The Journal of Borderland Research. Riley Crabb soon became a well known and much appreciated lecturer on borderland subjects and the couple were often travelling to many cities acrosss the U.S. Lectures and donations was an important part of the income. As esotericist Riley was well aware of that the use of drugs was not the correct path in spiritual development but he was not afraid to make a test on himself. 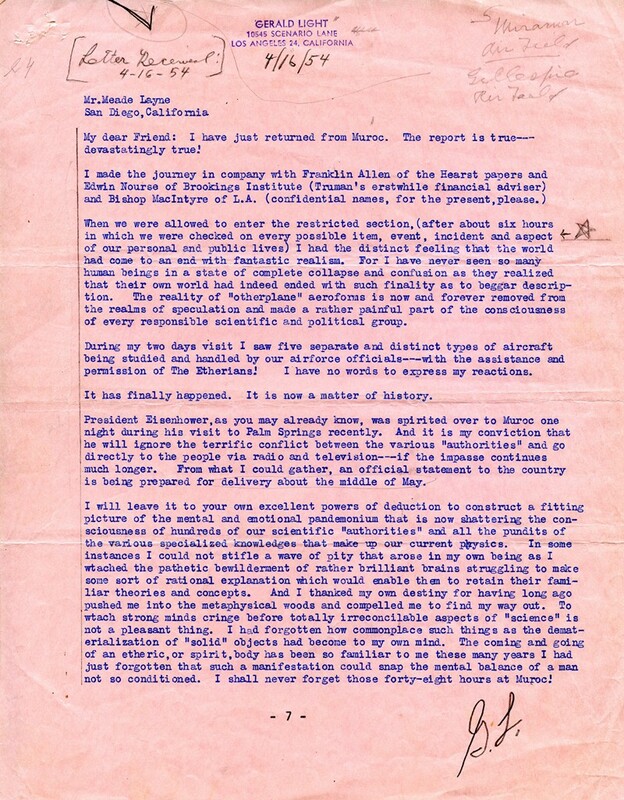 On December 28, 1964 he wrote to Dr. Timothy Leary describing an experiment with Mescaline. This was before Timothy Leary in 1966-1967 became the guru of the counterculture movement, with his famous phrase ”turn on, tune in, drop out”. Riley wrote: ” ”… I had a psychedelic experience at their Socorro, New Mexico clinic in the Spring of 1963… My reaction to the mescaline was positive, a very deep and satisfying spiritual experience.” Riley had been given half a gram of Mescalin at the clinic of Drs. John and Louis Aiken, Socorro, New Mexico. The visions hade lasted for six or seven hours and Judy sat beside Riley during the experiment and tape recorded the session. A very detailed description of this experiment was published in a 15- page article in Round Robin vol. 19, no. 5, July-August 1963. 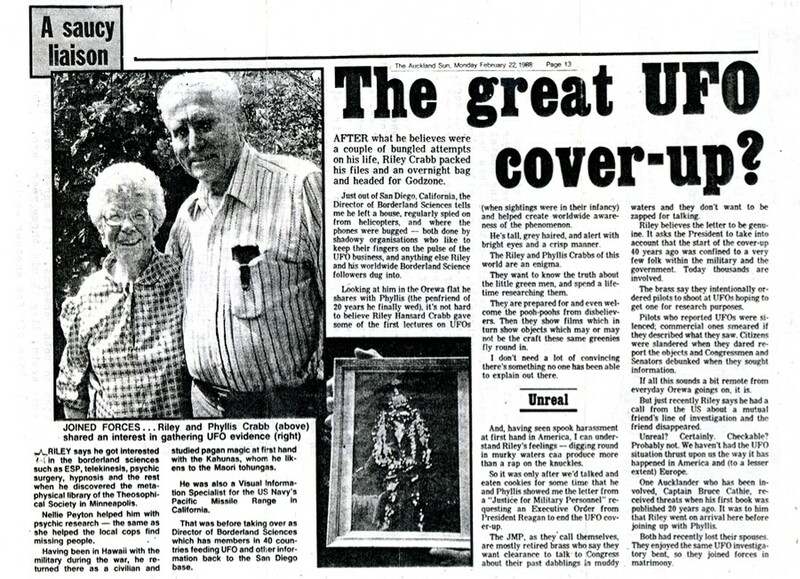 Riley Crabb had for several decades a deep inpact on many ufologists. 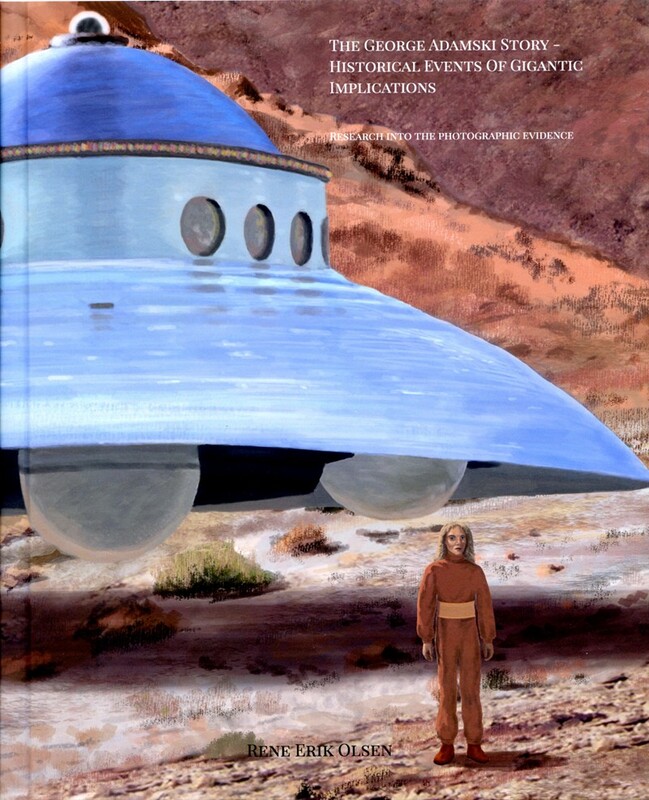 Still he has no separate entry in Ronald Story´s The Encyclopedia of UFOs or Jerome Clark´s The UFO Encyclopedia. 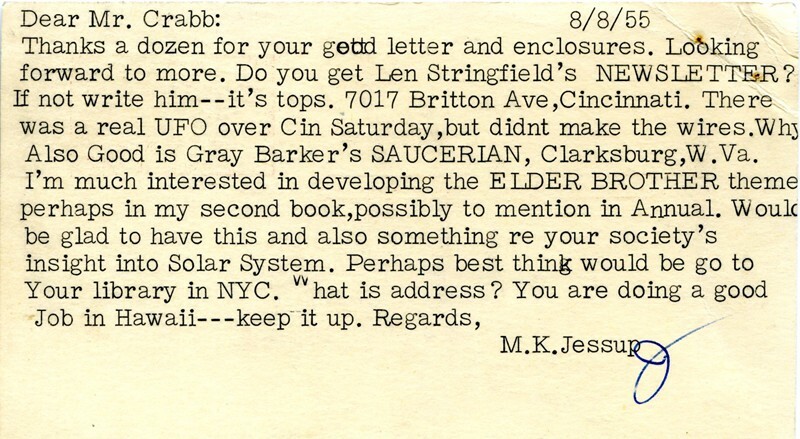 One of the American ufologists that regularly corresponded with Riley Crabb and asked for advice and opinions was Joan O´Connell (Joan Whritenour), editor of Saucer Scoop 1966-1970. In one letter May 25, 1973 she wrote ”You know, I just don´t READ your material, I STUDY it. And I have for years.” After Joan had some problems with the controversial contactee Ted Owens, Riley Crabb wrote: ”… his connections with elementals he calls Saucer or Space Intelligences. 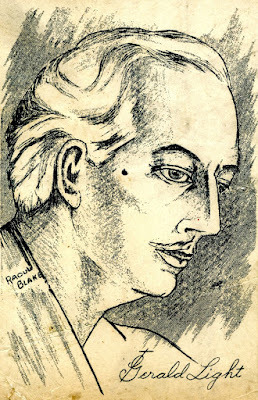 My favorite Kabala teacher, Dion Fortune, warns us to beware of the self-trained occultist. In my estimation, Owens falls into that category. The fact that he drained you of energy during a visit points toward elemental vampirism. They get drunk on human vitality… That he is a truly dangerous character is proven by the willingness to call upp great storms and other destruction without a second thought or concern about the misery, death and destruction he is causing. He thinks he is using the SI´s to cause these spectacular demonstrations of elemental power, but in the long run he will discover that the Elementals are using him for their purpose. When he has served his purpose he´ll be tossed aside like a wet dishrag.” (Letter to Joan Whritenour, November 1, 1971). This warning is similar to the conclusion I reached after having read Dr. Jeffrey Mishlove´s book The PK man. When reading Riley Crabb´s articles and booklets you immediately notice his profound knowledge of The Esoteric Tradition. There are constant references to Helena Blavatsky, Charles Leadbeater, Alice Bailey and many others. Regarding Alice Bailey he commented: ”D.K.`s Treatise On Cosmic fire should be in every metaphysician´s library.” (Letter to Joseph S. Haas, August 30, 1983). 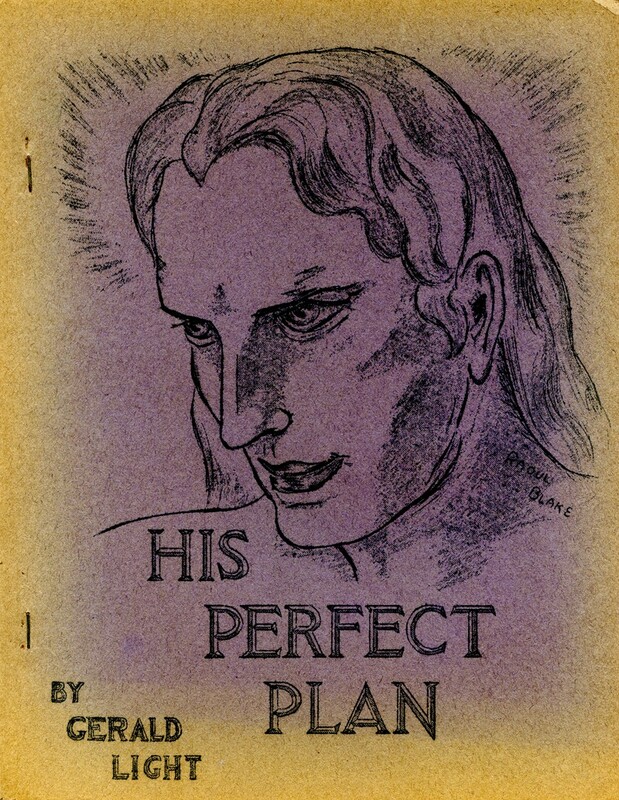 But Riley and Judy also wanted a more practical magical work, hence their study of Dion Fortune and Kahuna magic: ”The magickal system Judy and I study, the Cabala of the Western Mystery Tradition, has built-in safeguards for the calling forth and directing of these forces in constructive work. We are also well aware of the fact that our work is overshadowed by Inner Plane Teachers who supply knowledge and protection which saves us from burning ourselves to death in certain Alchemical experiments. The Arcane School of Alice Bailey is not our Path but we don´t hesitate to dip into the magnificent literature channeled through her for the edification of Students of the Mysteries here in America.” (Letter to Carl B. Cahill, October 30, 1976). In 1984 Judy Crabb suffered from various health problems so Riley had to reduce his BSRF work and lecture engagements: ”This belated reply to yours of Aug 4th indicates how far behind I got attending five conventions in the Summer. Maybe I´ll have to cut down next year, or even pass them all up if Mrs. Crabb´s health does not improve. Right now I´m a male nurse, as well as housekeeper and director of BSRF, and janitor, and am not accepting any lecture invitations.” (Letter to Mary Marie Satterlee, American Society of Dowsers, October 14, 1984). Unfortunately Judy´s condition did not improve and she became bedridden with a combination of pneumonia and acute pancreatitis. Judy Crabb died on July 12, 1985. In Round Robin, vol. 41, no. 5, September-October 1985 Riley wrote In Memoriam:”Do not stand at my grave and weep. I am not dead. I do not sleep. Judith Miyama Crabb, July 31, 1909 – July 12, 1985”. After Judy´s death Riley found a new director of BSRF and editor of Round Robin in Thomas J. Brown who entered his responsibilities beginning 1986. Riley left for New Zeeland where he married theosophist Phyllis Hall in December 1985. He continued writing articles and booklets until his death in January 20, 1994. Unfortunately his widow consigned Riley´s private archive to the municipal dump. Perhaps this was not only the fault of Phyllis Crabb. In a letter to me May 27, 1984 Riley said: ” :”I did find the 1973 file in the attic and am enclosing a Squance letter for you to follow up on. All of this old material is going to the dump when I sell out here, hopefully later this year.” This attitude to archives is tragical and for me and my AFU colleagues impossible to understand. Why destroy your life work? Riley Crabb was in many ways a pioneering and unique researcher in the Forbidden Science. His approach to esotericism was eclectic and open minded, sometimes, in my opinion, too openminded, when presenting channeled messages. But he was an accomplished esotericist which he proved in his comment in a letter to me after I had sent him The Knowledge of Reality by Swedish esotericist Henry T. Laurency: ” ”Yes, we did receive the Laurency opus and thank you very much. It appears that he is an initiate of some standing in the Western Mystery Tradition, and has some interesting, even startling, observations on philosophy and occult science, past and present. The Knowledge of Reality is a welcome addition to our reference library.” (Letter to me, December 18, 1981). I am deeply grateful for having known and corresponded with Riley Crabb. He was a mentor and a friend – even though we never met. It is a privilege for AFU today to be the custodians of the unique BSRF archive. A treasure trove of information for coming generations of scholars and researchers.